Abbas Kiarostami, an Iranian master filmmaker, passed away from gastrointestinal cancer in Paris today. As an avid fan of his humanistic, genre transcending films, I can say with a certain conviction that we've lost one of the greatest artists in the world of cinema. It was his film, Taste of Cherry, winning the Palme d'Or at Cannes Film Fest in 1997 that introduced poetic, meta-fiction laiden Iraninan cinema to the world and put many Kiarostami contemporaries (Jafar Panahi, Asghar Farhadi, Moshen makhmalbaf) on the world cinema map. But it was seeing one of his Koker trilogy, Wind Will Carry Us, that was a watershed moment for me in my cinematic education. I've never seen such a humanistic and poetic cinema before and the film made me scramble for anything Iranian afterwards. Over the years, even though his films were never overtly political (although they could easily be seen as Iranian sociopolitical fable), he found filmmaking increasingly difficult within Iran under the government censorship. I reckon it was exactly that transcending subtle artistry that fooled the censorship for a long time. Thankfully for us, it resulted in two international productions - Italy set Certified Copy in 2011 and Japan set Like Someone in Love in 2013. 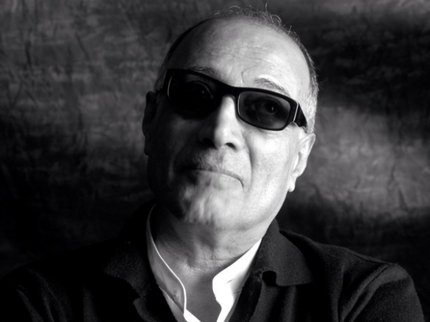 I had an honor and pleasure to interview Abbas Kiarostami in 2013 when his film Like Someone in Love played at NYFF. As expected, he was the warmest, wisest, humbliest, most thoughtful artist I've ever encountered in my short career as a film critic. New To Netflix: Miscellany Or Potpourri? Certified Copy is an amazing film. I'm still trying to unwrap the puzzle. True art cinema at its best! Indeed I just assumed he was about ten years younger than he was. This one is going to take a moment to sink in. While his last feature was a few years back I am keen to hear more about the mentoring he did for 54 short filmmakers earlier this year. Participating in something like that just proves how in love with cinema the man was.